The Food Alphabet and More: O, Wow! Fun and excitement awaits you at the Oishi Snacktacular 2015! O, Wow! Fun and excitement awaits you at the Oishi Snacktacular 2015! This year, Trinoma Activity Center will be transformed into an Oishi factory! Don’t miss your chance to run and play in awesome booths this Aug. 7, 8 and 9! Your P 20 will go a long way at Oishi Snacktacular. For a minimum fee, you can refresh yourself with Oishi Slush C+; your favorite Smart C+ in slushie form! If you’re a big Oishi Choco Chug fan, you would want to cool down with some Choco Chug ice cream at the O-Twirl Booth and top it off with some Oishi Pillows, Wafu Leche Flan and 2 new savory toppings. You surely wouldn’t want to miss your chance to make your very own Oishi snack at the Make Your Own Snack station! Run and go crazy at the Snack Shack booth as you fill up your limited edition 2 ft. Oishi giant pack with all your favourite Oishi snacks and beverages in 60 seconds! Oishi, being the brand that always aims for fresher and more exciting ideas, brings in a new addition to the Snacktacular experience: the Oishi Snack Catcher! Remember that arcade game where you try and grab treats with a robotic hand? Well, now you can be that hand! Get strapped up and guided to an enormous pool of Oishi snacks and grab all the treats you can take with your own hands! Some kind of catch isn’t it? While enjoying all these fun stations, the members of Team O will grace the event with more entertainment and performances. Elmo Magalona, Slater Young, Ramon Bautista, Kathryn Bernardo, Daniel Padilla will be joined by Oishi’s newest endorser for Crispy Patata, the beautiful and funny Alex Gonzaga. Oishi and Team O are upping the O, Wow! factor of this year’s Oishi Snacktacular! Now talk about fun and excitement! Don’t miss your chance to party with your favorite Team O members and bring home a whole bunch of your favorite snacks and other goodies! 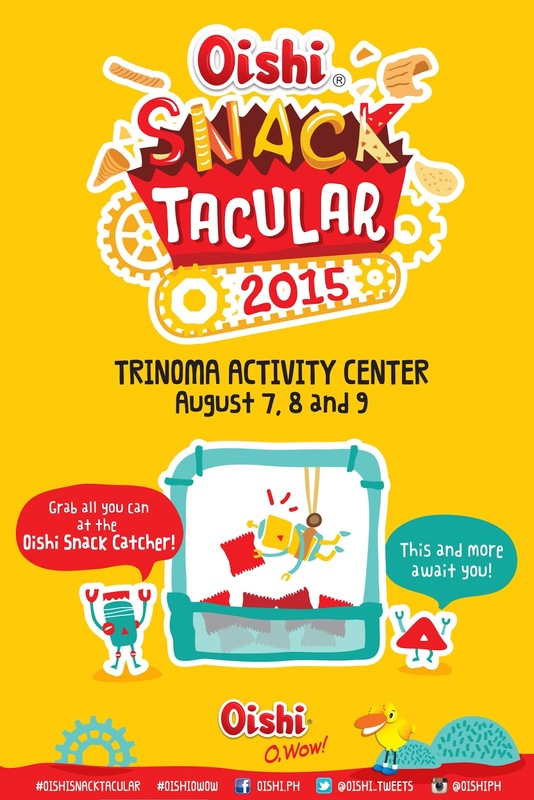 Drop by Oishi Snacktacular on August 7, 8 and 9 at the Trinoma Activity Center, the most “O, Wow!” event of 2015! For more information log on to www.oishi.com.ph or visit Oishi’s Official Facebook page at www.facebook.com/oishi.ph.